Years ago, D's very first teaching position was as choir director at Monroney Jr. High in Midwest City. He earned "rookie of the year" right off the bat, and his beloved mentor teacher was his counterpart in marching band. We love her to this day. In fact, just last weekend we had the honor of being present as she was inducted into the OKMEA Hall of Fame - a truly dedicated teacher. So it wasn't a surprise to receive an email from her this past June right after we moved in. It was, however, largely unexpected to learn that just that morning a member of the choral team at the University of Oklahoma had resigned from his position. Just that very morning! She forwarded his resignation to me and asked me to pass it on to my unemployed Music Man. Several people assumed that we already had the OU position lined up before we moved and that we simply kept it a secret. That is not the case at all. We had already moved, I was shopping for the perfect cake studio space, and David was feverishly sending out his CV. Needless to say, it all came together and we are so very grateful for HIS faithful provision. Now, I sit here at the beginning of 2014 quite frankly in a state of shock and awe at all that has happened over the past 365 days. Overwhelmed with gratitude and at the same time filled with anticipation for the next 365. I would be lying to pretend the past year was without struggle, or turmoil, or a sufficient number of heartbreaks, but the positive always outweighs the negative...if only by choice. As I reflect and contemplate the changes that need to be made for 2014, I realize more than ever before how valuable and fleeting my time really is. There is a constant struggle to maintain a flow between work and family while continuing to date the most perfect man for me. I think any artist can appreciate the mentally draining task of creating new work, while trying to perpetuate some level of originality and integrity. The life of an artist is equal parts stimulating and draining. 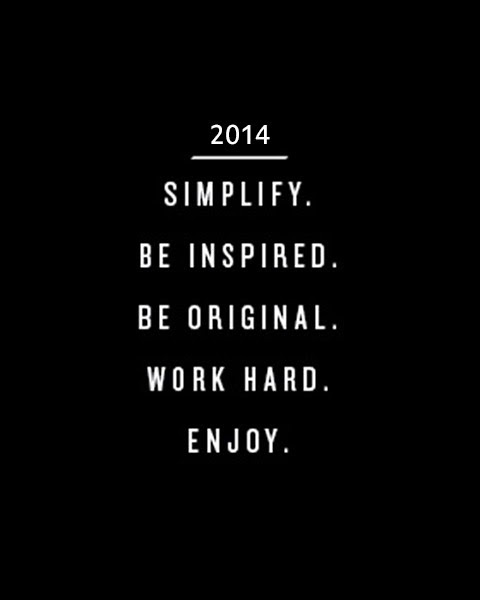 All things considered, I find myself drawn to a simplified 2014 - more than ever before. To rekindle a love for feeding my soul with books never-before read, places never-before visited, hikes never-before climbed, foods never-before eaten, and quiet time with my heavenly Father. I sat down to write this post two or three...okay six...times. I've never officially been diagnosed with ADHD, but it's quite obvious I am burdened with chaotic focus and I think that's pretty much the same thing. "Chaotic focus" being in and of itself an oxymoron I know. Regardless, I sometimes always get distracted. Amazingly, I do get plenty of things accomplished though often in roundabout ways. *SIGH* It really is mentally draining to live in this skin. We are quickly approaching an event that beckons for girlfriends to get together, put their feet up and enjoy a night filled with girl talk, fashion, champagne, and laughter. The Golden Globes. And then a few weeks later...The Oscars/Academy Awards. Any party isn't a party without yummy hors d' oeuvres to munch on and great music. Here, I give you the first of a few appetizers I plan to share in the coming weeks for your partying pleasure. Begin with cherub tomatoes. Cut off the top of each tomato and use the small end of a melon baller to scoop out the insides. Don't worry about getting every last seed out of the center, just a small scoop allowing enough room for dose of bleu cheese cream in the center. I then turn them over onto a rack or cookie sheet in order to drain out the excess juice. They don't need to be completely dry, but leave them to drain at least 30 minutes or so. 1/4 to 1/2 cup crumbled bleu cheese. Begin with the 1/4 cup and add more depending on your taste and if you like bleu cheese. I happen to love it, so I go all in with 1/2 cup (maybe even more...I really do love those little tantalizing bleu nuggets of tastebud awakening). Mix everything together on high speed until well combined, scraping down your bowl at least once to make sure all of the ingredients have married nicely. 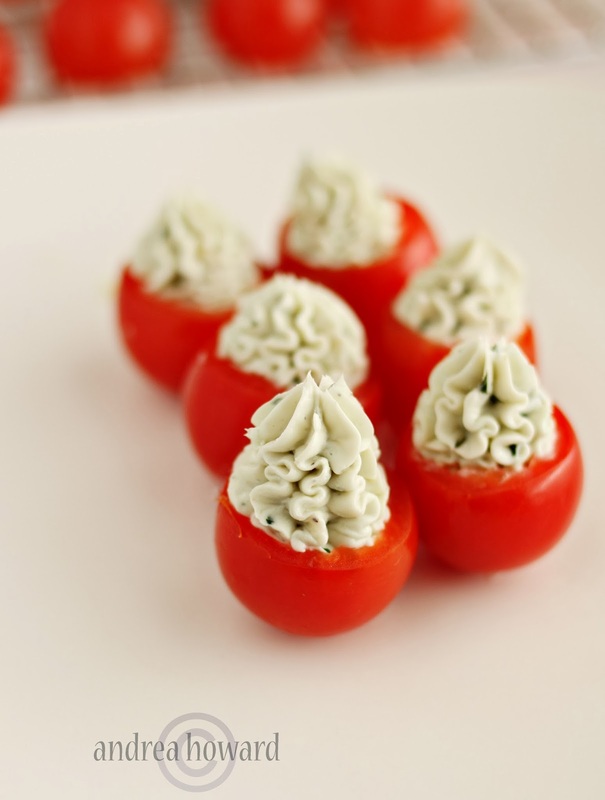 Fill a pastry bag fitted with a start tip with the cream cheese mixture and pipe the creamy goodness into the prepared tomatoes. I hope you will try making these for your next gathering! Enjoy!